The Russian Sukhoi Su-24M2 aircraft provided to Syria are being effectively used in the fight against Daesh terrorists in the Aleppo area, Syrian Gen. Hassan Hassan told the Russian Izvestia newspaper. Aleppo has seen intense fighting over the past few months, with the Syrian army and local militia forces having managed to encircle large groups of terrorists in some districts of the city. “These aircraft have performed in southern and south-western suburbs of the city [of Aleppo], where the terrorists’ main offensive was directed at. The targets there were the militants’ camps, command posts and convoys, including armored vehicles,” Hassan said. He stressed that the Russian Su-24M2 aircraft are highly effective and have helped target the terrorists’ logistical facilities. 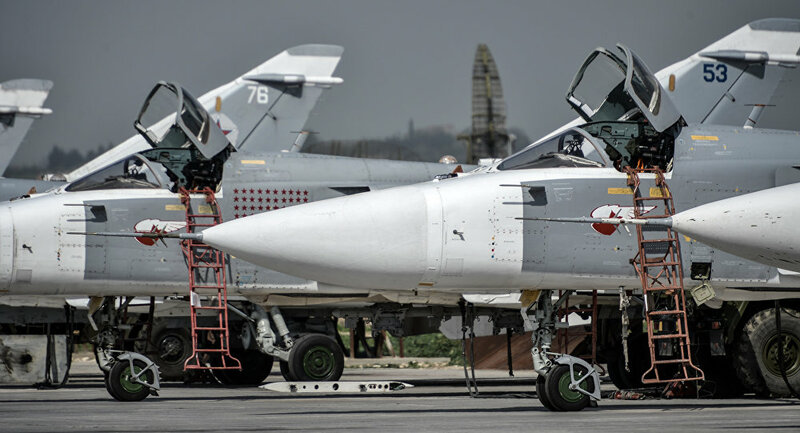 “If we talk about the geography of the aircraft use, besides Aleppo, Su-24M2s have actively worked on targets in the provinces of Idlib and Hama, from where the terrorists based in Aleppo get all the necessary supplies,” the general said. Syria has been mired in civil war since 2011, with government forces loyal to President Bashar Assad fighting a number of opposition factions and extremist groups. On February 27, a US-Russia brokered ceasefire came into force in Syria. Terrorist groups such as Daesh, as well as Jabhat Fatah al Sham (also known as Jabhat al-Nusra, or al-Nusra Front) are not part of the deal. Both groups are banned in Russia and a range of other countries. The Syrian Air Force has received its first two upgraded Sukhoi Su-24M2 all-weather attack aircraft from Russian armories. According to media reports, they are expected to improve the combat capabilities of Syrian air power in the fight against the terrorists. However, according to experts, Moscow and Damascus may also have a hidden motive. According to Al-Masdar News, in addition to the two planes already delivered, Syria expects to receive another eight aircraft in the near future. The planes are said to have been retrofitted with new equipment “to enhance their capabilities and improve their combat efficiency,” including improved avionics, featuring both GPS and GLONASS, and a new heads-up display. The deliveries are said to be part of a defense order signed back in 2009. “Naturally, closer cooperation between aircraft and armored vehicles, artillery and infantry requires that pilots speak the local language, and are acquainted with the tactics of national units. [Therefore], as I understand it, Russia will continue to supply the Syrian army with arms – both new and upgraded. And this will continue regardless of negotiations with the United States,” Kedmi concluded.For his part, Semyon Bagdasarov, the director of the Center for the Study of the Middle East and Central Asia, could not rule out Mardasov’s suggestion that the delivery of the aircraft was aimed at strengthening the Syrian military’s potential, including against the so-called ‘moderate’ jihadists. Finally, for his part, Sergei Balmasov, an expert at the Moscow-based Institute for Middle East Studies, emphasized that Moscow must be careful not to completely ignore Washington’s interests in Syria.”It remains necessary, in one way or another, to coordinate our activity with the Americans, so as not to overstep a ‘red line’ of sorts. Washington has the capabilities to do us a great deal of harm across the former Soviet Union, as in Ukraine, as well as in Syria. They can increase their deliveries of more advanced weapons systems to the Syrian rebels,” for example. “Additionally,” Balmasov noted, “it is important to preserve the possibility of political dialogue with the US, and the Syrian conflict is one of the few topics we can talk about.” Ultimately, the analyst noted, fighting against the so-called moderate Syrian opposition “is necessary, but we are forced to try to walk around the lines drawn by Washington.” Otherwise, the US may work even harder to step up political and military pressure against both Damascus and Moscow.